Lardos is located south of Lindos on the east coast of Rhodes. It is a peaceful traditional village with a sand and shingle beach. Lardos holidays attract families and couples of all ages who are looking for safe bathing and a low key nightlife. The village is considered to be one of the prettiest on the island where visitors can wander the narrow cobbled streets and the tree lined squares taking refreshments in pavement cafes. The view from the Acropolis above the town is spectacular. 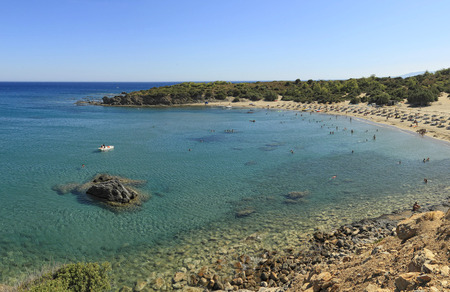 Holidays to Lardos offer a choice of beaches, Lardos Bay and Glystra, where there is good provision of water sports. We have a number of cheap Lardos holidays that offer particularly good value for families. So if you are looking for a relaxing spring break or want to be sure of summer sun, check out our Lardos holiday bargains and you'll surely find one to suit. You could soon be bathing in warm clear waters, sipping wine in a taverna on the waterfront or dining under the stars. Please use the 'search' to find our best Lardos holiday deals.